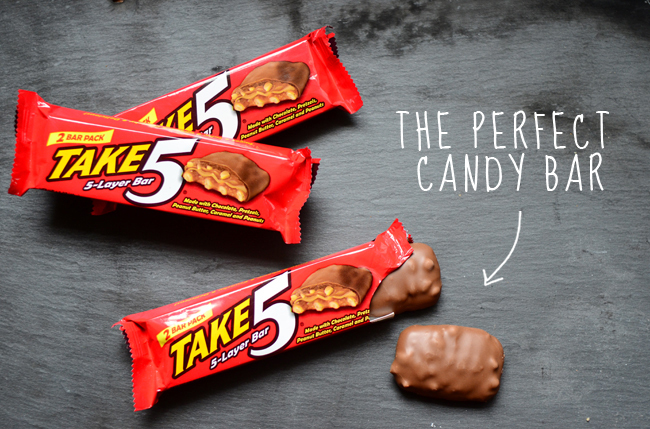 There's no argument here...Take 5 is the best candy bar around. 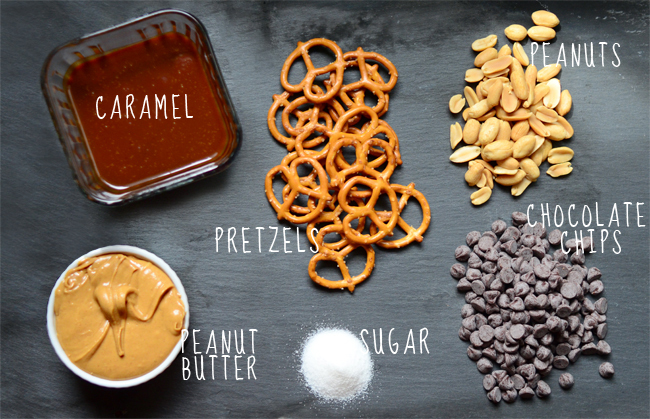 Snickers and Twix don't stand a chance in the fight against the perfect combination of chocolate, peanut butter, pretzels, peanuts and caramel; Take 5 is the epitome of a successful salty sweet treat. The only downside is that Take 5 bars are actually pretty hard to come by these days! Despite my pleadings to every grocery store in New York, nobody seems to have them in stock. In fact, tracking them down has become a treasure hunt of sorts for me and my co-workers. Once we find 'em, we stock up. I could reveal my hiding spots, but I'm sure my co-workers would immediately raid my desk (that's not where I hide them, just so you know!) 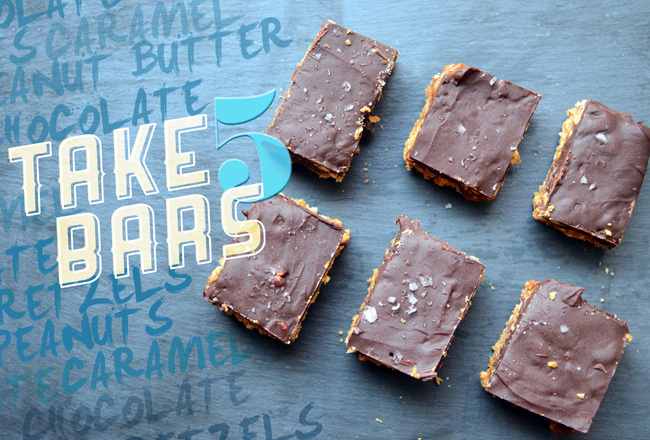 Are Take 5 bars hard to find where you live, too? 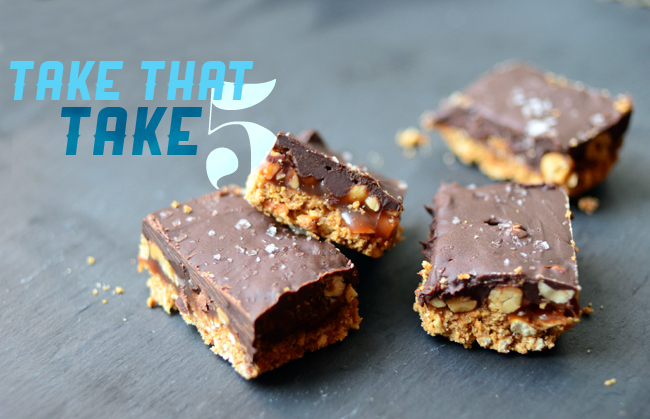 I've created these easy homemade Take 5 bars to satiate your need when there's no candy bar in sight. Find your own stash spot for these bars, because they're that good. 1. Preheat the oven to 350 degrees. Line an 8x8" pan with parchment paper. In a food processor, pulse the pretzels, peanut butter and 2 tablespoons of sugar until the pretzels are crushed into small bits and the mixture clumps together. Press firmly into the pan and bake for 10 minutes. 2. In a saucepan over medium hear, stir remaining 1 cup of sugar and water until sugar dissolves. Increase heat to high and boil sugar for about 5 minutes, or until the color begins to darken. Swirl caramelized sugar to mix and continue to cook until it's a medium amber color. Remove from the heat and carefully whisk in the heavy cream (it will bubble violently, so stir carefully!) and vanilla. Set aside to cool. 3. 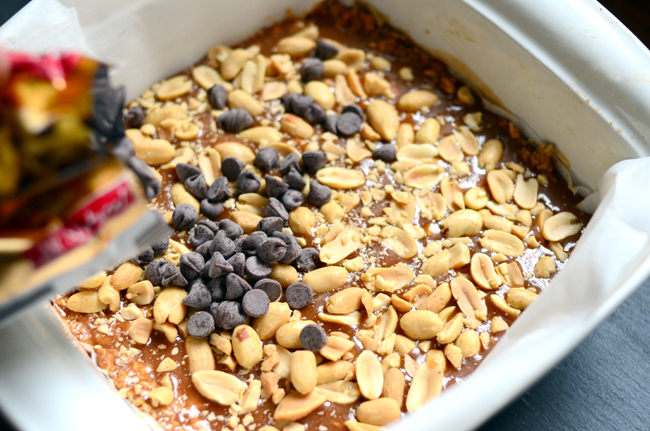 Pour caramel over the pretzel crust, then top with chopped peanuts. 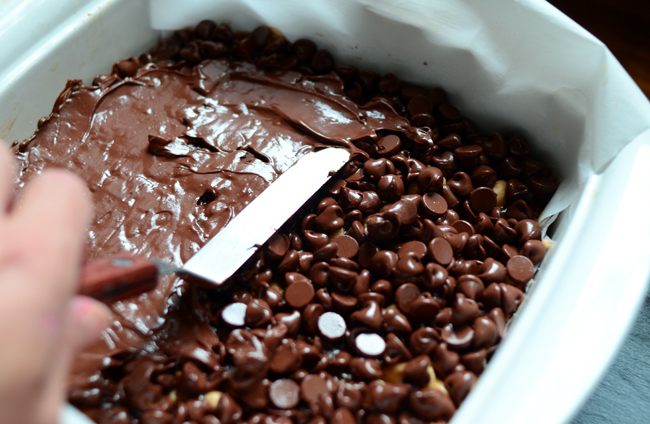 Lastly, cover all the peanuts with the chocolate chips and bake for 10 minutes. 4. Use an offset spatula or knife to smooth out the chocolate chips while they're still warm and top with sea salt or crushed pretzels. Let cool to room temperature, then chill in the refrigerator for a couple hours, or until chocolate hardens. 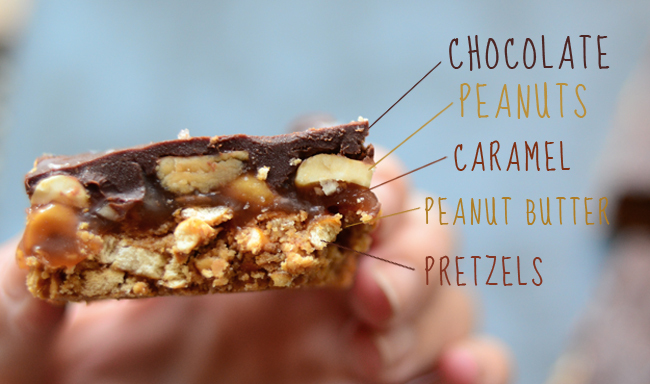 Slice into bars and serve! 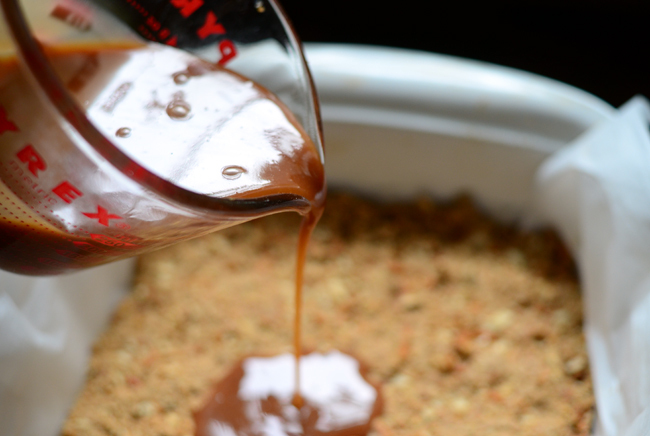 Caramel is really simple to make, but you can buy it pre-made if you're short on time. Get the recipe card here! Would you mind letting me know what font you used for the number "5" in these, and the handwriting font for all the ingredients? I'd really appreciate it! The "5" is Nouvelle Vague and the handwriting is Levi Brush and Sue Ellen Francisco. Thanks! These look dangerous! 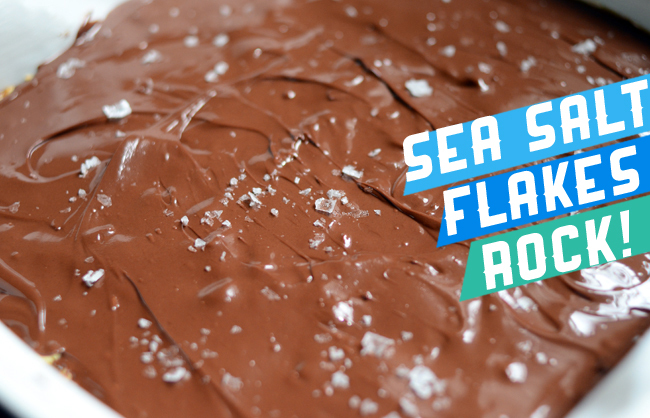 I love anything with that addictive salty-sweet combination. Very nice and innovative idea!!! Mmm wow! This looks amazing! I love that you were inspired by the candy bar but didn't actually use the candy bar in your recipe. The bars look rich and AMAZING! :) I especially love the picture showing all of the different components/layers. YUM! If you have trouble finding Take 5, you can find them at www.candyfavorites.com. They will ship them to you. Great customer service. I used to work there in the shipping dept. I am horrible at making homemade caramel...I always burn it! What pre-made caramel do you recommend?